Los Angeles is often perceived as the capital of reinvention. It’s where millions come to seek out new identities, where highways, buildings, and even city limits are in a constant state of change. In Los Angeles, we look ahead. 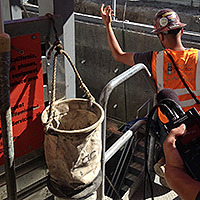 But even here, reminders of the past sometimes come to the surface: two weeks ago, ancient fossils were discovered at the Metro’s westside extension construction site. Since spring of last year, Metro Los Angeles has been heaving up dirt by the crane-load to form an “exploratory shaft” at Ogden and Wilshire—the future site of a new subway station along the extended Purple Line. Construction just so happens to be taking place across the street from our offices, so we figured we’d stop in and see what exactly had been unearthed. Pine cone scales, Monterey cypress fragments, seashells, sand dollars, massive clams, and a chunk of what is likely a sea lion’s jaw have all been pulled out of the mostly asphalt-soaked sediment. Many of these specimens are in near-perfect condition—astounding given that surrounding soil samples date to at least 300,000 years old, a time when most of Los Angeles was still beneath the Pacific Ocean. Kim Scott, a project manager with Cogstone Resource Management and the lead paleontological monitor on the Metro project, watches for fossils as the digging exposes them. As a trained paleontologist, she also interprets them. “The plants we’re finding—the digger pines, the Monterey Cypress—tell us that L.A.’s climate used to be a lot like the Monterey Peninsula, with cooler temperatures and more rain,” she says. She went on to explain that the combination of terrestrial plants and marine animals tell us the mid-Wilshire area was likely an intertidal zone, or very close to shore. Now over 65 feet deep, the exploratory shaft represents the preliminary phase of building the new station. Authorities are in the throes of analyzing the soil make-up and verifying that it will hold up to construction. They’re also getting a sense of which ancient remains are likely to appear as the process continues. The Wilshire/Fairfax station is slated for completion in 2023, with the full Purple Line extension in place by 2036. In our fast-changing city, that might seem like an eternity, but take it from the fossils—in the grand, long life of the land we call Los Angeles, it’s only the blink of an eye. Next articleEssential T: Torta Cubana at Super Tortas D.F.